Historically the deal with Royal Dutch Shell (NYSE: RDS.A)(NYSE: RDS.B) stock went something like this: in exchange for a mature, low growth business operating in a cyclical sector of the economy you got a fairly dependable dividend at an attractive yield. 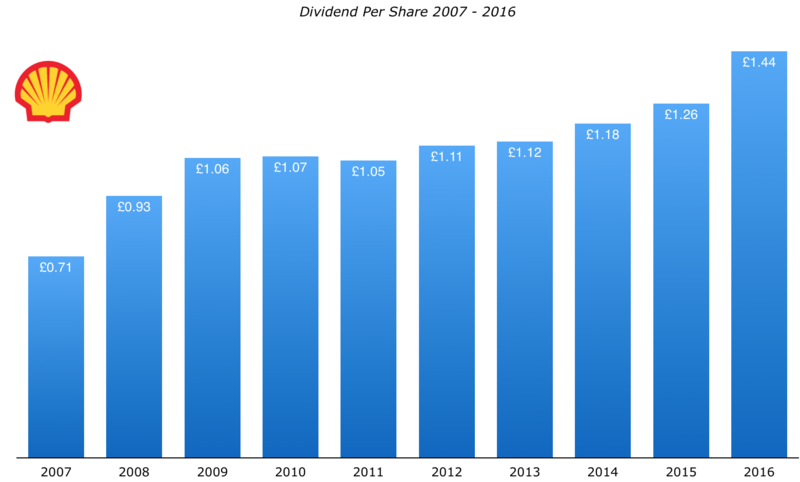 Indeed for much of Shell’s history the average dividend yield was somewhere around the 5% mark. Throw in commodity price inflation, plus a steadily increasing reserves base, and you pretty much get the short version explaining how Shell stock managed to deliver such great long-term returns during the second half of the 20th century. The other point I would add about the Shell dividend is that it typically gave investors something to hold on to when the stock wasn’t up to much. Consider the past ten years, a period which has resembled something of a lost decade in terms of the share price. Let’s say you are a UK based investor back in April 2007. You look up the quote for Shell stock and see the shares trading at £17 each. Fast forward ten years to the present and the current quote for Shell stock is only around 30% higher at £21.90 per share. Run the math on that 30% over a ten year stretch and you’ll find it probably just about matches inflation. That’s exclusively in terms of the share price. Shell, however, has also paid out just under £11 per share in dividends in that time. Factor that into the equation and suddenly your annual returns don’t look too bad all things considered. Needless to say if you reinvested those dividends along the way then total returns would look even more respectable. Given the above it’s not at all surprising that folks are now sweating over the company’s dividend. In fact with Shell the situation is arguably more acute given the importance of the distribution to investors in Europe. In the United Kingdom, for example, it accounts for something like 10% of total stock market dividends, and you could probably populate a small country with pensioners who look to the Shell dividend to top up their income. So are these concerns justified? Let’s go ahead and take a look. Between 2011 and 2015 Shell saw its reserves drop from 14 billion barrels of oil to 11 billion barrels. Now you don’t need me to tell you the importance of reserves to an oil company, however the key point is that during this time Shell still spent $150 billion on capital expenditures. Cashflow from operations during the period totaled $200 billion and dividend payments basically made up the difference. For a capital intensive business like Shell it can be tricky to balance the need for high levels of capex with the dividend. When that dividend is sacrosanct it gets even trickier. The mega-deal to buy BG Group’s 3.5 billion barrels of proved reserves represents a potential remedy for this issue. The short version: more reserves, more production and more cashflow equals a secure future dividend. The flip side to the deal is twofold in the short term. Firstly, the mixture of cash and shares as the source of funding means that the share count is enlarged at a time when dividends are burdensome. Before the deal Shell had 6.2 billion ordinary shares outstanding and a dividend commitment of $1.88 per share. Post-deal the enlarged share count is now 7.9 billion with the dividend unchanged in per-share terms. In total the dividend therefore equates to a cash outlay of approximately $15 billion per year. Secondly, the cash portion of the deal has naturally required the company to take on a load of extra debt. At the end of 2016 the total debt on Shell’s balance sheet stood at $92 billion. That figure may sound astronomical on its own, but bear in mind we’re talking about a company with over $400 billion worth of assets including $19 billion in cash & cash equivalents. Still, the fact remains that we’re looking at around $75 billion in net debt and an annual dividend commitment that’s somewhere in the region of $15 billion per year. How does that stack up with what’s going on with the underlying business? To get a handle on things let’s look at the company’s most recent set of operating figures. In the final quarter of 2016 Shell managed to bring in $9.2 billion in operating cash flow. Its capital expenditure commitments were $6.2 billion and the dividend took up a further $3.8 billion. There are, however, some additional points to consider. Firstly, around $1.5 billion was settled under its scrip dividend program (i.e. issuing new shares as dividends rather than cash). 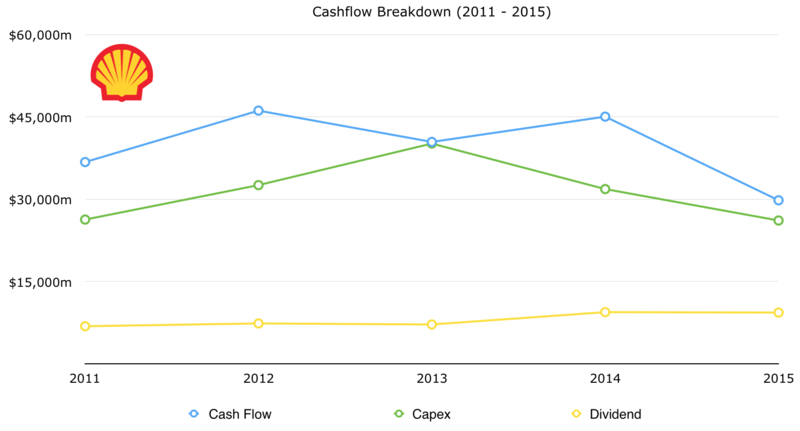 In other words cash outlay was around $8.7 billion versus cash inflow from operations of $9.2 billion. In addition Shell is selling a bunch of assets under its divestment program. This brought in an extra $3 billion during the quarter. Okay, so where does this leave us going forward? First of all, Shell expect the divestment program mentioned above to reach $30 billion in total by the end of 2018. The company have recently announced a bunch of deals such as the disposal of North Sea assets, worth up to $3.8 billion, and the $7.25 billion disposal of its Canadian oil sands assets. By way of comparison total divestments made to date only come to around $5 billion ($3 billion of which was in Q4 2016). All-in-all there’s probably a further $10-$15 billion yet to be realized over the next couple of years. Ordinarily you’d think that championing the sale of assets to fund a dividend isn’t particularly smart. It’s behavior that more resembles some kind of high risk annuity rather than a sustainable blue chip dividend payer. In the case of Shell there are a couple of mitigating circumstances though. Firstly, this kind of flexibility is fine on a short-term basis in a period of commodity price volatility. Secondly, and the more relevant reason in the long-run, the BG Group acquisition represents something of a game changer with a future emphasis on natural gas. It would be normal for Shell to undergo a fairly large scale strategic repositioning of its underlying business in those circumstances. Shell is guiding for capital expenditures of around $25 billion in 2017. If we assume the scrip dividend conserves cash in the same ratio as 2016 then we’re probably looking at additional cash outflow of around $10 billion on top of that. All-in-all this would leave the total outflow side of the equation at around $35 billion for this year. Assuming oil prices stay at their current level my guess is that 2017 will see Shell post a material improvement on the $20 billion in cash flow it generated last year. As a rough guide it will probably fall somewhere between $25-$30 billion. As for the sensitivity to the price of oil, every $10 change to the per-barrel price will add/subtract $5 billion to/from that cash flow figure. Factor in the proceeds from the divestment program and the dividend looks covered. More importantly there should be enough left over to chip away at that rather large $70 billion net debt pile. We’ll have a slightly clearer view when Shell reports Q1 2017 results in a few weeks, although it’s fair to say that dividend growth is probably off the table for a while. Reducing debt will also take priority over the dividend should it come to that. On a longer-term time frame there’s more to be upbeat about. There’s a bunch of projects due to come online this year, not to mention the long-term cashflow from the BG Group assets. Estimates indicate that these new projects will add a further $10 billion to operating cashflow by 2018. In a $60 per barrel oil price scenario Shell is saying it could realistically generate in the region of $20-$30 billion worth of free cash flow by 2020 – enough to cover the dividend and tackle debt. With the shares currently yielding 6.65% I think that would be enough to make the stock relatively attractive for the long run.